BB creams promise the best of both skincare and makeup, combining the jobs of a moisturizer, primer, sunscreen, concealer and foundation. A daily routine that can take minutes becomes an instant task thanks to the power of BB Creams. However, finding the perfect all-in-one BB cream, is not that easy. There may be a lot of BB creams in the market, but few truly give the complete benefit of intensive whitening and sun protection. Now the search is over with the new Belo Intensive Whitening BB Cream. It delivers that instant flawless no makeup look as your skin whitens over time. Its Tone Correcting formula evens out skin tone and conceals skin imperfections like scars, fine lines, and wrinkles. Even better, it has the power of Kojic Acid and Tranexamic Acid that over time improves skin clarity, whitens your complexion, and reduces the appearance of stubborn dark spots. 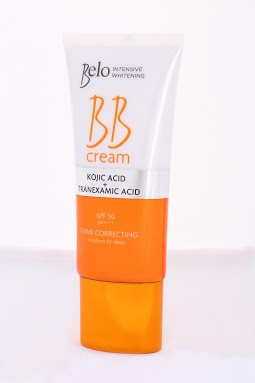 Belo Intensive Whitening BB Cream is also rated SPF 50 & PA++++, protecting your skin against age-accelerating UV rays.